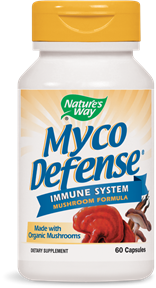 Myco Defense® is the ultimate blend of mushrooms for the immune system. Myco Defense® is made with organic mushrooms. Harvested at each phase of maturity for a richer potency. Our unique processing system, plus the addition of Vitamin C and organic Ginger Root, improves the body’s ability to absorb mushroom’s key ingredients – at least 3 times better than other brands. Take 2 capsules daily with water. More can be taken as needed or directed by a physician.